The Background: Small town teenager Jeffrey Beaumont (Kyle MacLachlan), succumbing to voyeuristic and sexual urges, has struck up a relationship with nightclub singer Dorothy Vallens (Isabella Rossellini). Jeffery soon finds himself sliding into Dorothy’s seedy world of mystery, crime and sadomasochism. The devil leading the dance in this suburban hell is the volatile snarling Frank Booth (Dennis Hopper) – Dorothy’s boyfriend. Frank catches Jeffery and Dorothy together, and as punishment, forces them to accompany him on a late night visit to associate Ben’s (Dean Stockwell) apartment. The Scene: Frank, along with his gang and hostages, arrive at Ben’s apartment after a turbulent “joyride”. Dorothy is allowed to go and see her captive son, who’s being held by Frank as collateral, while Ben entertains his guests with a musical request from Frank. It’s become rather passé to sing the praises of David Lynch. Everything is slowly become ‘Lynchian’. Just as ‘Kafkaesque’ refers to a bureaucratic nightmare and ‘Ballardian’ technology led dystopias, the Missoula born director has been reduced to a byword for weird. If music or a TV show is ‘Lynchian’ presumably it’s a bit dreamy, a bit mysterious, a bit surreal and odd. We’ve all become so blasé about Lynch that we’ve forgotten what made him so influential to start with. Lynch’s cannon has sent seismic waves through pop culture, far beyond what anyone would have fathomed when Eraserhead landed on this planet, but what exactly makes Lynch so visually fascinating and distinctive as a filmmaker? 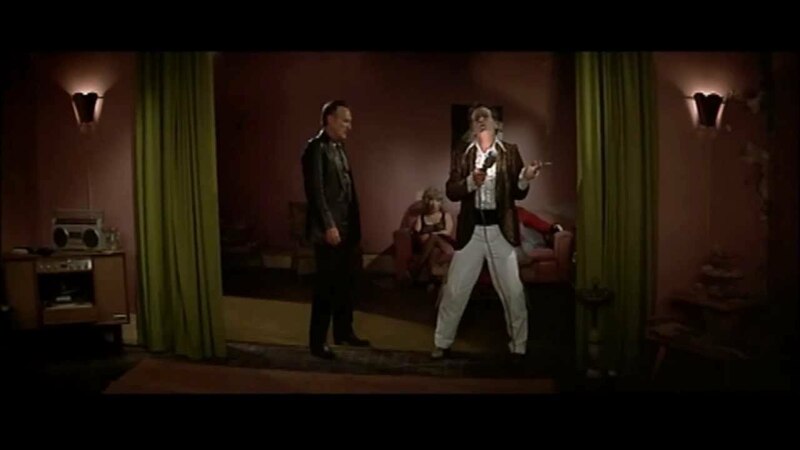 Cue Dean Stockwell miming along to Roy Orbison while Dennis Hopper wells up, a man dances with a snake and Kyle MacLachlan wonders for the audience quite what the hell is going on. The scene is indeed all the lazy Lynchian stereotypes; weird, surreal, dreamy and mysterious, but let’s find some method in Blue Velvet’s certain madness. Like the thud of steps in Point Blank’s hypnotic walking sequence, we’re immediately drawn to the music of the scene. Much of Lynch’s work focuses on bringing to light the darkness that hides in the shadows of normality, and Blue Velvet is an exceptional example. Blue Velvet’s setting, the sleepy logging town of Lumberton, is superficially the all-American white picket dream. But from the film’s opening salvo we’re made abundantly aware that not everything is ice cream parlours and sunflowers here. The highlighted scene features the operatic tones of Roy Orbison’s classic In Dreams – a man and song who impeccably encapsulate the dichotomy of light and dark. 1950s Rock ‘n’ Roll is often palmed off as trivial light-hearted fun, but, just like Lumberton, something much bleaker hides in its guitar laden rhythms. In Dreams is a sorrowful ballad lamenting the fact the ubiquitous ‘50s lover only exists in sleepy hallucinations. It’s not immediately obvious, but In Dreams is tragic as it is melodic. If sleep is the cousin of death, then perhaps only in dreams can we meet our lost loved ones again – both a blessing and a curse. Lynch once remarked “’50s music held a happiness, for sure…but Elvis also sings ‘Heartbreak Hotel.’ There’s a sweet sadness that could go either way.” His comments only ratify the significance of Roy Orbison’s In Dreams as the soundtrack to Blue Velvet’s central paradox of light and dark. For the majority of the film Frank is a manic fiend huffing nauseous fumes, but as the dulcet tones of the Big O kick in he’s calmed into dreams and memories. The beauty, sadness and nostalgia that the music evokes wells up in Frank pushing him into a catatonic state. Dreams have always played a huge part of Lynch’s work, from Twin Peaks to Mulholland Drive, and in this scene we see how he utilises dreams as both a narrative instrument but also as a visual style. The music pushes Frank into his own imagination, his eyes closed as if yearning for sleep and dreams, while the room around him visually resembles a surreal dreamscape. The effeminate Ben, his face powdered like a ghost miming into a light, prances round the room followed by the quivering voice of Orbison. We’re drawn to Ben’s presence as the singer (well, mime), but what lurks in the background of the scene composition is even more intriguing. You’ll miss it originally, but the more you look, the more oddities you spy: a fat lady sits gazing at an object intently, an old lady stares on unimpressed, Dorothy shuffles out a room like a zombie, a man is slumped in a gas mask and, most bizarrely, a man cavorts with a snake. In this medley it’s only the bewildered Jeffery, who appears trapped in his own personal nightmare, we can identify with. The whole sequence is composed to bring about striking juxtapositions and unsettling contrasts. There’s a deliberate depth to the shots which only distorts our senses further as characters appear completely out of sync with one another; some stand, some sit, some sway, some are motionless. The framing shot showing both Ben and Frank side-by-side (above) utilises all these elements to completely scramble our senses and perception. We’re left unsure whether to laugh or cry…perhaps we’re not that different to Frank in that respect. And even like a dream, the musical interlude ends abruptly with no warning jolting us back into the narrative. The episode is reminiscent of Buñuel and Dali’s classic surrealism in that Lynch creates a sequence that juxtaposes endlessly and almost randomly. Dreams aren’t congruous or logical, and neither is David Lynch…or so he’d like us to think. On first watch the sequence appears to be a bizarre splurge of ideas that have randomly fallen in such way, however the visual, and audio, impact of the scene is far too great to go down as mere chance. Lynch is a visual director guided by the infinite possibilities of our subconscious, and the appropriately named In Dreams sequence wonderfully illustrates his ability to create iconic moments that become impossible to forget once seen. If filmmaking is a dream factory, capable of dramatizing and visualising our subconscious, then surely David Lynch is its chief madcap architect and engineer. Outstanding description . Thanks you!